Apsley Cherry-Garrard (a survivor of Robert Falcon Scott’s fateful final expedition to the South Pole) on the penguins in Antarctica. It was easy to fall in love with the penguins in Antarctica, just as we did with the minke whales in Antarctica. Having never seen them in their natural habitat before, watching them up close going about their daily business was truly fascinating and comical at the same time! They always brought a smile to our faces, we just loved them. We were lucky to see 4 different types of penguins on our trip. 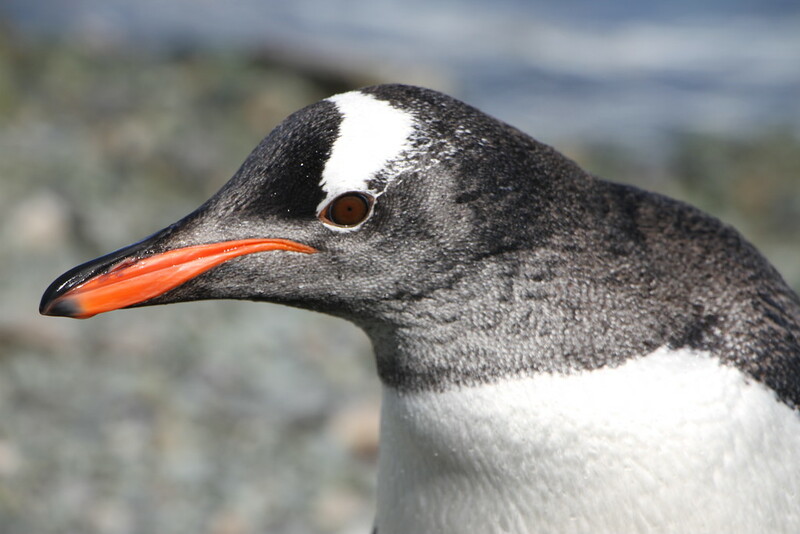 The first penguins we encountered were the ‘Gentoos’, recognisable by a wide white stripe across the top of their black head, a bright orange bill, pale pinkish webbed feet and a longish tale. With streamlined bodies they are also very fast swimmers, able to reach speeds of 36 kph! We witnessed this often from our zodiac as they porpoised around us at great speed, making it tricky to grab a photo! 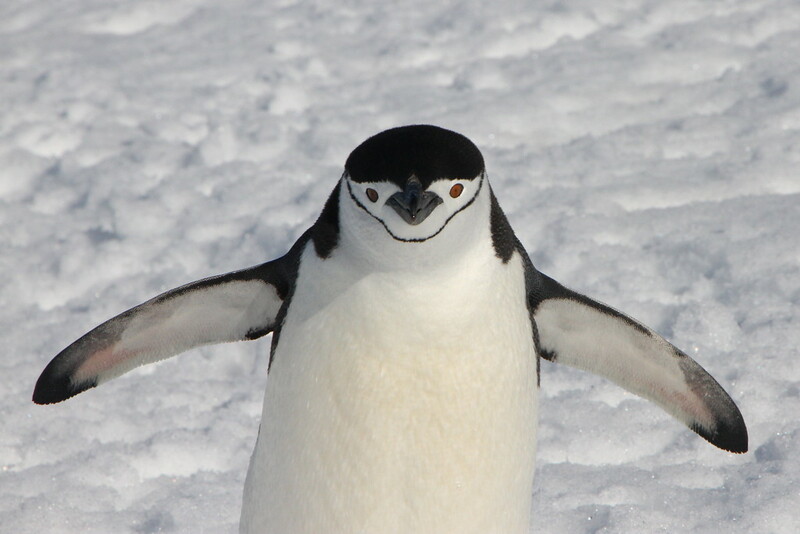 However like all penguins, they certainly don’t boast the same elegance or speed on land! 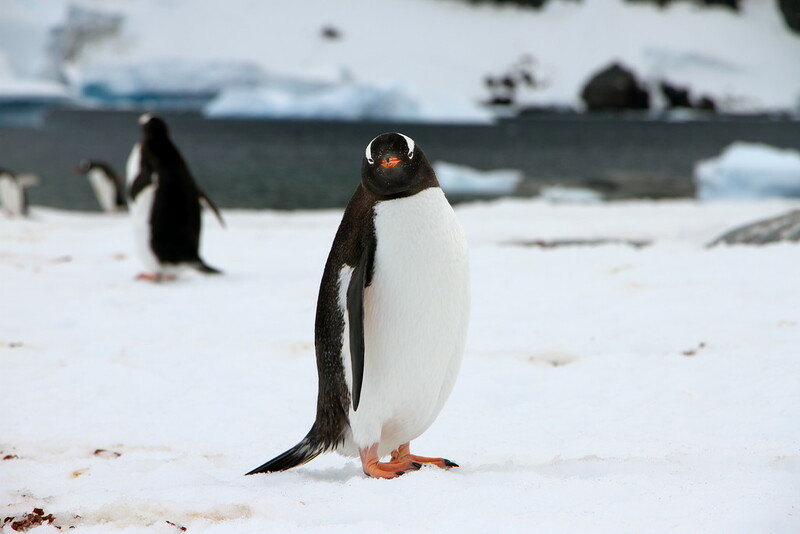 We never got bored of watching them waddle along the snow, tail sticking out behind, sweeping from side to side – such a clumsy and adorable sight! 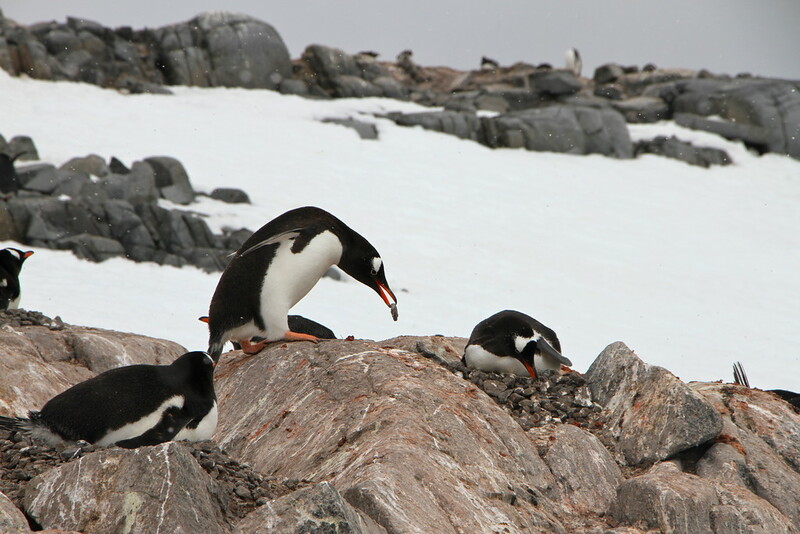 We saw lots of Gentoo penguins in Antarctica, but one of our favourite moments was when we witnessed one cheeky Gentoo carrying out the common stone stealing game! We were familiar with this from a David Attenborough documentary but seeing it for ourselves was amazing and hilarious! We stood for 15 minutes watching the fascinating process of a male penguin performing his daily routine of sneaking around other mother penguins looking to steal the precious stones that they’re using to protect their young egg. The aim of course to increase the size of his partner’s nest. It’s a status thing for the male penguins – bigger the nest, better the father apparently! Wanting to avoid a fight, he would also target the most vulnerable mothers without a partner next to them standing guard. As you can imagine they got really upset about losing stones but couldn’t do much about it being perched on their eggs. No doubt their partner would return later though to steal the stones back…yep, the process is never ending! We found out that each nest typically fluctuates up and down 50 times per day as a result of stone stealing! Amazing, you would think they had a better system by now! The next type of penguin we saw was the ‘Adelie’. Slightly smaller than the Gentoos, these were recognisable by their almost full black faces, broken up only by a thin white ring around their eyes. Different to the Gentoos, their black feathers extend further along their bills, making the bils look smaller as it hides most of the natural redish/orange colour. Appearing all black and white and with a longish tail, these guys looked the smartest. Almost as if they were wearing a tuxedo! The most special moment we had with these guys was witnessing the first chicks of the season! After walking out to an outcrop on the continent, we watched two tiny brown furry chicks being lovingly protected by both parents amongst a small colony of Adelies. We couldn’t believe we were witnessing the first sighting of chicks for the season, an incredible sight! Next up we met the ‘Chinstraps’ who quickly became our favourites! Most aptly named, these were easily recognisable by their white faces and thin black line underneath their cheeks, making them appear as if they were wearing helmets – so cute! Our favourite moments with these guys was simply sitting watching them manoeuvre themselves up and down what we called the ‘penguin highways’. 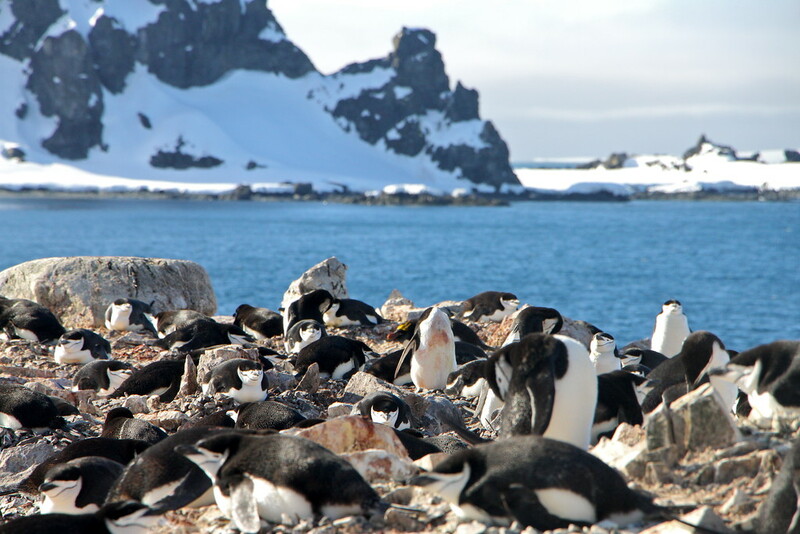 After some time spent fishing for krill in the nearby waters, they would hop back onto land and make the often long trek back up a hill of deep snow to reach their colony and breeding spot. Trying to make the journey easier for themselves, they often followed the same pathways of already flattened snow to reach their colony, hence the creation of penguin highways! Keeping our respectful 5 metres distance recommended to us by Quark Expeditions, we positioned ourselves next to the highways as they offered the best viewing of their adorable waddling, often in groups of two of three. Occasionally the penguins were just as intrigued by our presence, and would take a little detour over to briefly check us out, before continuing merrily along their way. 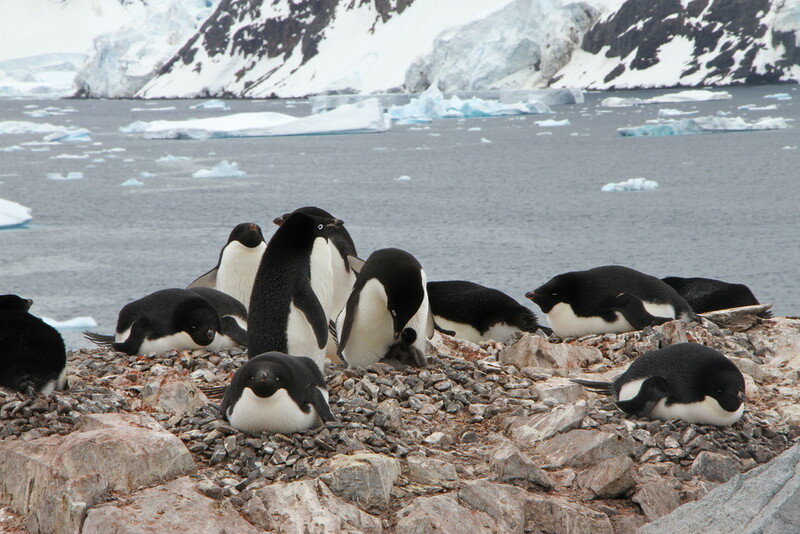 We also learned that it’s common for penguins to get lost in Antarctica and end up in the wrong colony! I guess it can be easily done after spending a little too much time chilling out on a floating iceberg, or trying to recognise one snowy island from another! 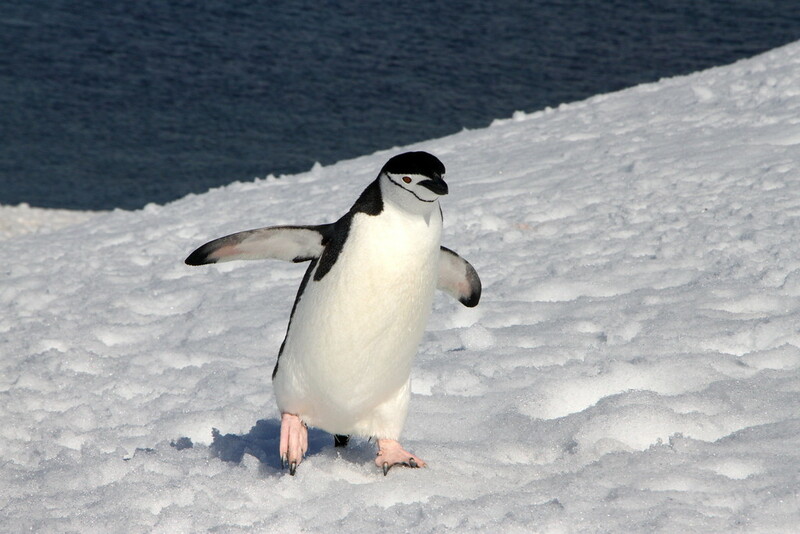 Anyway this was the reason that we saw a 4th type of penguin that we didn’t expect to see – the rock star ‘Macaroni’! Easily recognisable by its distinctive spikey yellow feathers sticking up above their eyes, we spotted one of these amongst a huge colony of Chinstraps. The poor guy had drifted so far from home that he had to settle with making friends in the closest colony he could find! We had no idea this could happen, see if you can spot him! We never imagined that we would grow to love the penguins in Antarctica as much as we did, but we found ourselves excited every time we encountered the penguins! We were sad to say goodbye to them! 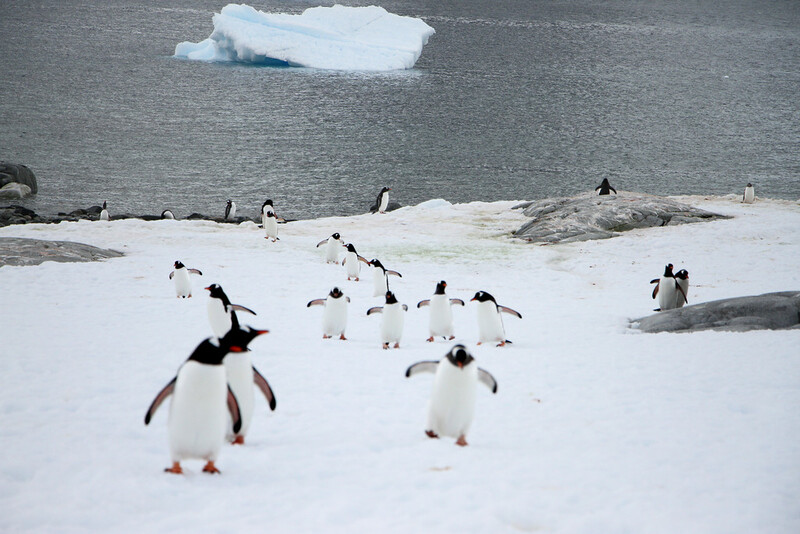 Luckily there was plenty of other wildlife in Antarctica to come! Thanks Kieron, it’s an amazing trip to do! Thanks for sharing as well, much appreciated! These pictures are absolutely gorgeous and the penguins are just adorable ….. What a fabulous time you’re both having…. Thanks Helen, glad you liked them! Hands down our favourite animal in the world!